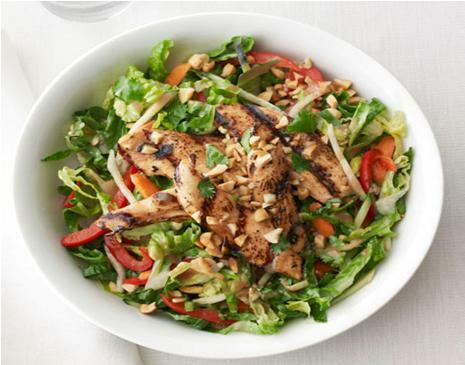 Chicken Satay Salad is a quick, light, refreshing and healthy dish. It is an exceptional choice for light lunches or dinners and the buffet style parties. In addition to that, this yummy salad keeps everyone well for some time, so you can take it along to picnics or day trips as well. Pre-heat your grill pan or grill to medium-high temperature. Now, cut the skinless boneless chicken breasts into about half inch thick chunks and place in a bowl. Add in 2 tablespoons of peanut sauce, ¼ teaspoon of kosher salt and ½ tablespoon of vegetable oil. Sprinkle the ingredients with some ground black pepper to taste and toss all the ingredients until the chicken pieces are well coated. Place the chicken-mixture in a baking sheet and place it in the pre-heat grill. Now, roast the chicken pieces for about 2 minutes per side or until lightly tender. Remove the chicken from grill and transfer to a large serving platter. Set aside until lightly warm. In the meantime, pick a large bowl and pour in remaining peanut sauce and vegetable oil. Top with some fresh lime juice, 2 tablespoons water, finely sliced romaine lettuce, cucumber slices, cilantro, carrot pieces, and the bell pepper slices. Season the mixture with some salt and ground black pepper to taste. Now, take a large spoon and mix all the ingredients until coat and smooth. Arrange four medium salad bowls in an order and divide mixture among them. Top the mixture in the bowls with roasted chicken chunks, peanuts and some additional cilantro. Your Chicken Satay Salads are ready, serve warm and enjoy.